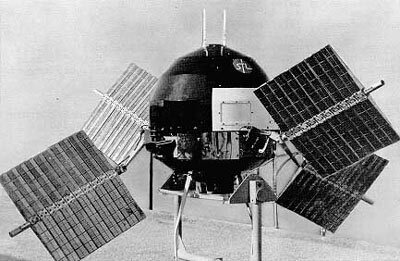 Explorer 6 (S-2) was a small, spheroidal satellite designed to study trapped radiation of various energies, galactic cosmic rays, geomagnetism, radio propagation in the upper atmosphere, and the flux of micrometeorites. It also tested a scanning device designed for photographing the earth's cloud cover. The satellite was launched into a highly elliptical orbit with an initial local time of apogee of 2100 h. The satellite was spin stabilized at 2.8 rps, with the direction of the spin axis having a right ascension of 217 deg and a declination of 23 deg. Four solar cell paddles mounted near its equator recharged the storage batteries while in orbit. Each experiment except the television scanner had two outputs, digital and analog. A UHF transmitter was used for the digital telemetry and the TV signal. Two VHF transmitters were used to transmit the analog signal. The VHF transmitters were operated continuously. The UHF transmitter was operated for only a few hours each day. Only three of the solar cell paddles fully erected, and this occurred during spin up rather than prior to spin up as planned. Consequently, initial operation of the payload power supply was 63% nominal, and this decreased with time. The decreased power caused a lower signal-to-noise ratio affecting most of the data, especially near apogee. One VHF transmitter failed on 11 September 1959, and the last contact with the payload was made on 6 October 1959, at which time the solar cell charging current had fallen below that required to maintain the satellite equipment. A total of 827 h of analog and 23 h of digital data was obtained.